Bushmills is offering two shot glasses as a gift with purchase to celebrate their 405th anniversary. 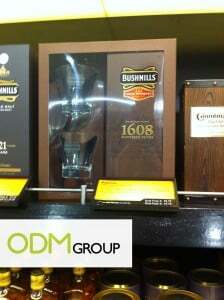 This gift with purchase is available at the Ireland duty free store with every purchase of their 1608 Irish whiskey. Want to grab hold of these limited edition shot glasses? Hurry down to the Ireland duty free store now and these shot glasses would be yours! Built on the foundations of 400 years of producing classic Irish whiskey, Bushmills 1608 is a superiorly smooth, flavorful, melt in your mouth whiskey. This whiskey owes its creaminess to a specialty barleycorn malt that takes on a crystalline appearance after a light toasting. The bottled 1608 is a blend of Bushmills malt whiskies, a small amount of Irish grain whiskey and the crystallized malt. Why did Bushmills use these shot glasses as a gift with purchase? Shot glasses serve as a perfect gift with purchase as they complement the whiskies very well. These shot glasses are essential, practical and you can save on extra costs needed to purchase new shot glasses if you don’t already own one. If you have friends coming over to your house for a drink or house warming party, fret not as these shot glasses would definitely come in handy. Other brands like Jack Daniel’s and Johnnie Walker can also make use of these shot glasses as a gift with purchase to entice customers to buy their products. How can these shot glasses help to increase sales for Bushmills? Every company aims to boost its sales revenue through the use of gift with purchase as they help to attract more customers. Bushmills has imprinted their company name and logo on the shot glasses as a form of identity which would help to increase brand awareness. Every time one picks up the glass, they would immediately see the company logo and be reminded of Bushmills. This would aid in brand recollection and induce customers to make repeated purchases. With more customers repurchasing whiskey from Bushmills, the company would be able to generate more revenue in the long run.